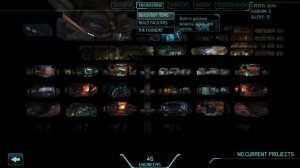 XCOM: Enemy Unknown is a turn-based tactical role-playing strategy video game developed by Firaxis Games and was released on PC, Xbox 360, and PS3. I rented the PS3 version through Game Access. 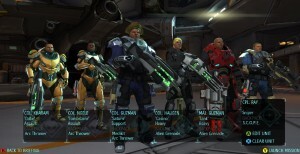 The game places the player as the Commander of X-COM, a multi-national organization designed to fight alien threats. While no threats are occurring the player runs the operation of the base, including buying new equipment for the team, new satellites and fighter aircraft to protect member nations, and new facilities like labs and workshops which help your scientists create new equipment. 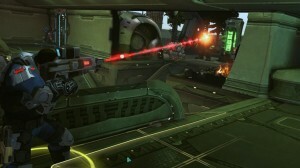 When a threat occurs the player controls a group of 4 to 6 elite soldiers in a turn-based isometric 3D battlefield. This is a great way to break up the game, you aren’t fighting for really long sessions (my typical attack lasted between 20 and 60 minutes) and then you return to the base with some form of spoils that you can use to research and build new items. After you have finished all the tasks you want to in the base you can look for threats, which advances the clock very fast and can help finish off research or building of facilities. The isometric 3D view of the battlefield is also interspersed with 3D cut-scenes and intermittent camera shifts which follow a soldier have you tell him to move or shoot. This not only changes the view but enlivens the battle as well. There are many different battlefields which are chosen randomly by the game and have aliens spawned somewhat randomly which makes replaying battles different almost every time. The “fog of war” system keeps you from seeing too far ahead of your soldiers and makes for some surprising encounters. When the soldiers come back they receive experience for the kills they made in the field and will level up over time. As they level up they will gain skills appropriate to their class. The classes are Sniper, Assault, Heavy, and Support. Each have their strengths and weaknesses. The Sniper is great at range and with some skill upgrades they can shoot at things outside of their normal visual range, but the typically cannot shoot after moving until the next turn. 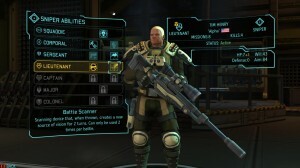 The Assault specialist is designed to be a front line combatant, starting with a shotgun and the ability to move twice and still shoot they are great for running up and saving another solider if an alien gets too close or used for bait but their damage is weak at range and they don’t have much in the way of special moves. The Heavy weapons specialist has a chain gun and a rocket launcher which both do massive damage (the latter does a lot of collateral damage which can cause problems in some scenarios), but they cannot move nearly the same distance as other classes per turn. The Support specialist can move much further in a turn than any other class and has the ability to carry two items in addition to their weapons and armour as well as the ability to use smoke grenades for cover and use med kits 3 times more than any other class. 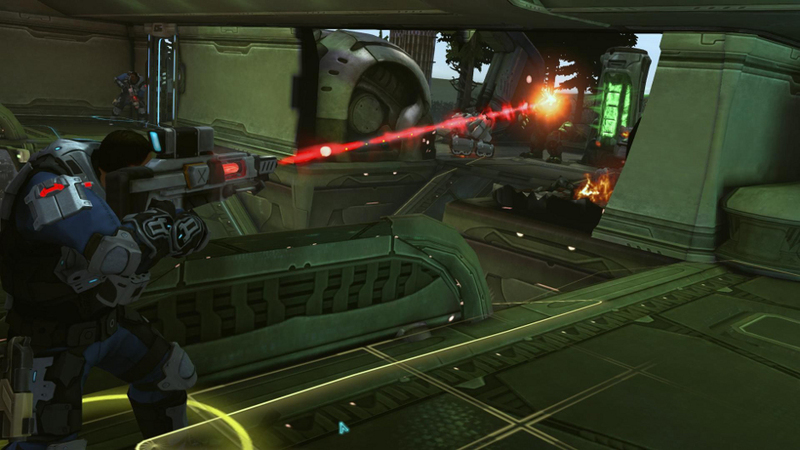 Later on some soldiers may develop PSI abilities which give them even more skills to rely on. The battlefields have almost fully destructible environments, you could shoot the side off a house to remove the aliens cover and they might put the car on fire that you are hiding behind giving you only a turn or two to get away before it explodes. All of the scenes and levels are designed very well, but especially good looking are the facilities in the base. These are shown in what is affectionately called the “Ant Farm View” which shows a cut-away of the base which goes about 5 levels into the ground and 6 rooms wide. When you start only the first floor is accessible and you must pay to build a lift to the lower levels and to excavate the areas before a facility can be placed in it. This is essentially a 2.5D view, but the little rooms are so detailed, and some like the gym have off-duty soldiers working out in them. When you capture an alien you can see it standing in the Containment facility. It’s a great attention to detail which had me staring at each little room in detail for minutes at a time. The controls and GUI for the game were great, it was always really clear where you were moving a soldier, or what you were having him shoot. The isometric battlefield was rotatable to get different angles and building in the cameras way would fade out when necessary. The cover mechanic was very easy to grasp as well, as it added a virtual shield icon facing in the direction of the cover and would highlight to show when the soldier you were commanding would be in cover. The controls would always try to helpfully snap to the nearest node (such as cover) but was not too forceful to move past. If you moved the cursor up the stairs the altitude changed fluidly and if you wanted to command a soldier to climb a ladder to the roof that was also very easy to handle. The tutorial explained all the basics in a very short time but was not overwhelming at all. 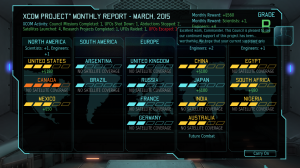 I had never played an X-COM game before, so following the suggestion I played on Easy mode, and ultimately I never lost a soldier, never had a member nation leave the project, got almost straight A’s on my monthly reviews and finished the game having researched everything I could. That all happened on what is actually my second play as the first one I quickly went through the story parts and got too far along without building up my soldiers skills or equipment and only had one save so I was stuck and had to restart. I plan to buy this game from Steam when it’s on sale, or includes the add-on packs in a Game of the Year edition and play it through on Normal, possibly with the Ironman mode turned on which auto-saves all the time but only allows one save game so if you lose a soldier you just have to deal with it. X-COM: Enemy Unknown reminded me a lot of the old Syndicate game while I was playing it and since I’d been planning on making a 3D isometric version of that game in my spare time, I think I will be taking a lot of queues from this X-COM game. Notably the controls and turn-based combat.